I spent a few weeks in China during the early summer of 2015. Trying to summarize a country this large in a couple sentences would be a waste of time, but I can say that the portions of the country that I saw offered incredible variety of scenery, atmosphere, and experiences. My visit was limited to the south-central portions, including Hong Kong, and portions of the states of Hunan, Guangxi, and Guangdong. There's a strong case to be made for Hong Kong's skyline to be named the most beautiful of any city on earth. Available in the following sizes (Panorama C): 30x10, 36x12, 48x16, 48x16 Triptych (3 x 16x16), 60x20, 60x20 Triptych (3 x 20x20), 72x24, 72x24 Triptych (3 x 24x24), 90x30, 90x30 Triptych (3 x 30x30), 108x36 Triptych (3 x 36x36). Hong Kong is a city that is divided into two parts by Kowloon Bay. 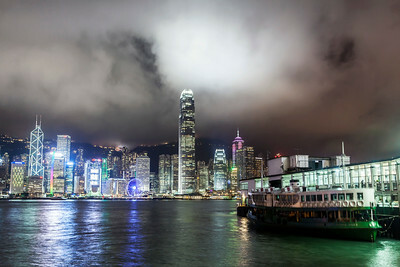 No visit to Hong Kong would be complete without setting foot on both sides of the bay, and doing so requires one to take the Star Ferry line. Keeping this in mind, I decided I needed to capture a photo of Hong Kong that accented the importance of the Bay, and this photo is the result. Available in the following sizes (Rectangle B): 12x8, 18x12, 24x16, 30x20, 36x24, 45x30. Hong Kong has one of the most spectacular city skylines on the planet. There are countless ways to frame the city, but this one, taken from Victoria Peak, is one of my favorites. Available in the following sizes (Panorama B): 30x12, 40x16, 50x20, 50x20 Triptych (3 x 17x20), 60x24, 60x24 Triptych (3 x 20x24), 75x30, 75x30 Triptych (3 x 25x30), 90x36, 90x36 Triptych (3 x 30x36), 105x42 Triptych (3 x 35x42). XingPing village, near Guilin, China, remains one of my favorite places I've ever visited. I met virtually no one here who spoke a word of English, so I had to figure out what I was going to see and do on my own. I spent most of my time simply wandering, trying to find good photo opportunities. And there were plenty to be found. I took a photo from this same location at sunrise, and knew that it was a good composition. 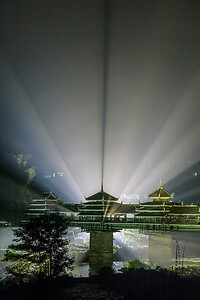 I'd also noticed, on prior evenings, that XingPing lights up at night. So I wandered back out to where I'd gotten my awesome sunrise photo, and waited for night. And when it came, the village lit up exactly as I'd hoped, allowing me to capture this stunningly colorful image. Available in the following sizes (Rectangle B): 12x8, 18x12, 24x16, 30x20, 36x24, 45x30. XingPing village, near Guilin, China, remains one of my favorite places I've ever visited. I met virtually no one here who spoke a word of English, so I had to figure out what I was going to see and do on my own. I spent most of my time simply wandering, trying to find good photo opportunities. And there were plenty to be found. Taken from the banks of the Lijiang River at sunrise, this is one of my favorite images of China. Available in the following sizes (Panorama A): 20x10, 24x12, 32x16, 40x20, 48x24, 48x24 Triptych (3 x 16x24), 60x30, 60x30 Triptych (3 x 20x30), 72x36, 72x36 Triptych (3 x 24x36), 80x40, 80x40 Triptych (3 x 27x40). 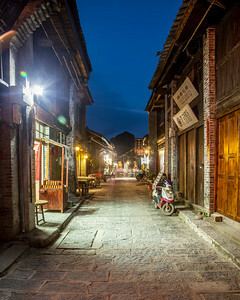 Xing Ping is a pretty Chinese village located on both shores of the Lijiang River. 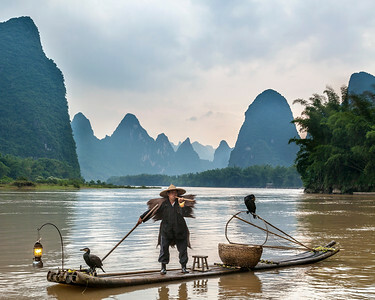 Not too long ago, fishermen in the village would catch fish using cormorants with necklaces that limited their ability to swallow fish above a certain size. The fishermen would then save the fish that were too large for the cormorants to swallow. Although this tradition is no longer in active use, the village celebrates its fishing heritage with performances showing how things used to be done. Available in the following sizes (Rectangle A): 10x8, 14x11, 20x16, 24x20, 30x24. XingPing village, near Guilin, China, remains one of my favorite places I've ever visited. I met virtually no one here who spoke a word of English, so I had to figure out what I was going to see and do on my own. I spent most of my time simply wandering, trying to find good photo opportunities. And there were plenty to be found. Although most streets in the village featured modern or somewhat modern architecture, there was one pedestrians-only street, where I took this photo, and where all the architecture was traditional. I actually ate dinner in the building on the left before I took this photo. Available in the following sizes (Rectangle B): 8x10, 11x14, 16x20, 20x24, 24x30, 30x40. XingPing village, near Guilin, China, remains one of my favorite places I've ever visited. I met virtually no one here who spoke a word of English, so I had to figure out what I was going to see and do on my own. I spent most of my time simply wandering, trying to find good photo opportunities. And there were plenty to be found. Boats seemed to play a large role in the economy of the village, and their frequently bright colors contrasted well with the brown water of the Lijiang River. 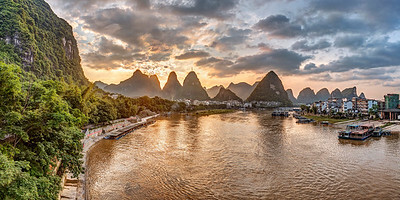 This photo was taken very close to the famous “20 Yuan Viewpoint,” so named because the scenery is iconic enough to be shown on the 20 Yuan (the currency of China) bill. Available in the following sizes (Rectangle B): 12x8, 18x12, 24x16, 30x20, 36x24, 45x30. XingPing village, near Guilin, China, remains one of my favorite places I've ever visited. I met virtually no one here who spoke a word of English, so I had to figure out what I was going to see and do on my own. I spent most of my time simply wandering, trying to find good photo opportunities. And there were plenty to be found. Boats seemed to play a large role in the economy of the village, and their frequently bright colors contrasted well with the brown water of the Lijiang River. Available in the following sizes (Rectangle B): 12x8, 18x12, 24x16, 30x20, 36x24, 45x30. XingPing village, near Guilin, China, remains one of my favorite places I've ever visited. I met virtually no one here who spoke a word of English, so I had to figure out what I was going to see and do on my own. I spent most of my time simply wandering, trying to find good photo opportunities. And there were plenty to be found. Boats seemed to play a large role in the economy of the village, and their frequently bright colors contrasted well with the brown water of the Lijiang River. Available in the following sizes (Rectangle A): 8x10, 11x14, 16x20, 20x24, 24x30, 30x40. I took this photo from Laozhai Hill, which lies on the edge of the Chinese village of XingPing. 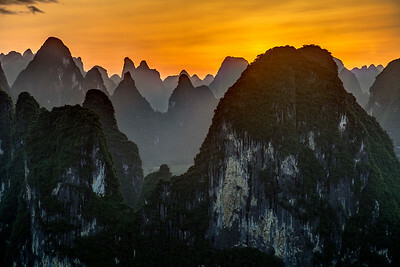 XingPing is surrounded by thousand-foot karst mountains, like those shown in this photo. Depending on the time of day one takes photos here, the mountains can look completely different. I took this photo with light coming in over my shoulder, and lighting the visible face of these mountains. The clouds floating throughout the scene lend a sense of mystery. Available in the following sizes (Rectangle B): 8x12, 12x18, 16x24, 20x30, 24x36. Laozhai Hill, on the edges of the small village of XingPing, China, is one of the best places I have ever gone to watch the sunset. 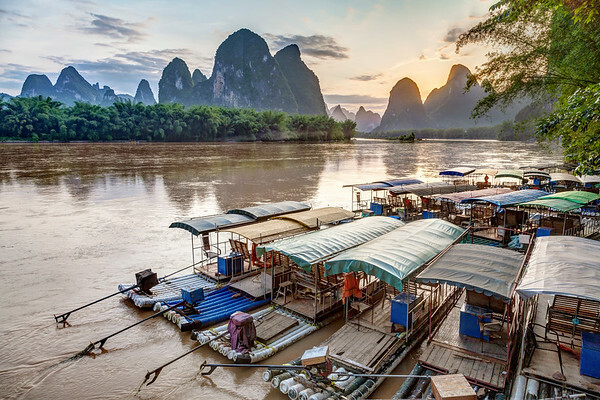 The Lijiang River makes nearly a complete loop here, and surrounds a portion of XingPing. 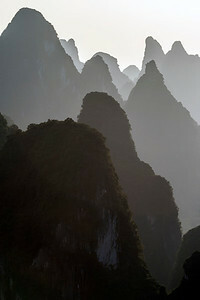 The karst mountains throughout the area are simply spectacular, and appear to go on forever. 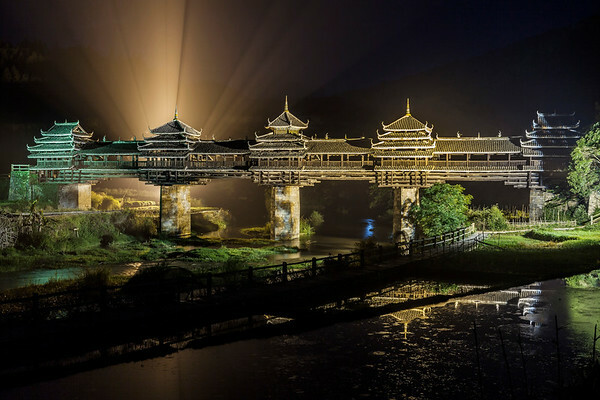 This is undoubtedly one of the most famous and picturesque locations in all of China. Available in the following sizes (Panorama A): 20x10, 24x12, 32x16, 40x20, 48x24, 48x24 Triptych (3 x 16x24), 60x30, 60x30 Triptych (3 x 20x30), 72x36, 72x36 Triptych (3 x 24x36). I took this photo from Laozhai Hill, which lies on the edge of the Chinese village of XingPing. 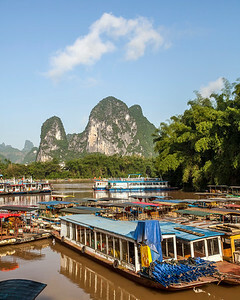 XingPing is surrounded by thousand-foot karst mountains, like those shown in this photo. Taken at sunset, the layers of mountains visible here give one a sense of scale of the place. Available in the following sizes (Rectangle B): 12x8, 18x12, 24x16, 30x20, 36x24, 45x30. 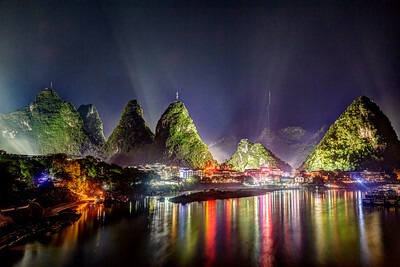 The city shown in this photo – XingPing – is, by Chinese standards, little more than a village. Surrounded by dense forests and steep mountains, it lies in the heart of one of the most beautiful locations I've seen. In the lower, left corner of this photo, the Lijiang River can be seen. The photo opportunities in this area stretch for miles in any direction, and it was from the top of Laozhai Hill, from where I took this photo, that many of my photos here were taken. Although getting here was a bit of a hike, the views made it well worth the trouble. Available in the following sizes (Panorama B): 30x12, 40x16, 50x20, 50x20 Triptych (3 x 17x20), 60x24, 60x24 Triptych (3 x 20x24), 75x30, 75x30 Triptych (3 x 25x30), 90x36, 90x36 Triptych (3 x 30x36), 105x42 Triptych (3 x 35x42). My three-week trip to China wasn't planned to the extent that many visitors would be comfortable with. After arriving in Hong Kong, I flew two hours north, to Zhangjiajie National Park, and beyond that, just knew that I had about two and a half weeks to get back to Hong Kong for my flight to Mongolia. The English ability of most people in China is very low, and it was only the occasional hotel worker with whom I'd be able to communicate. 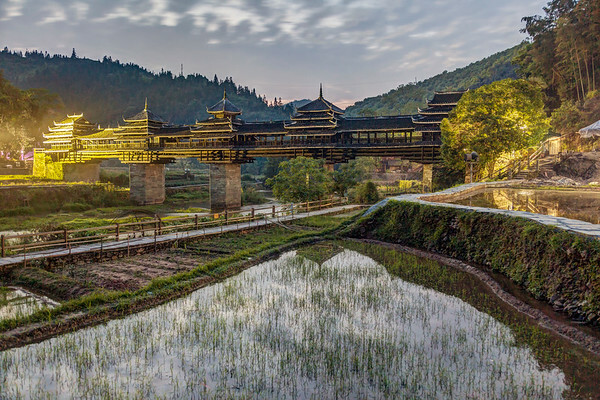 My coming to Chenyang – where I took this photo – would probably have never happened if I'd planned in advance, because it is relatively unknown, especially for foreign visitors. So I'm glad I was as unprepared as I was, because seeing this ancient bridge was one of the highlights of my time in China. Available in the following sizes (Rectangle B): 8x12, 12x18, 16x24, 20x30, 24x36, 30x45. My three-week trip to China wasn't planned to the extent that many visitors would be comfortable with. After arriving in Hong Kong, I flew two hours north, to Zhangjiajie National Park, and beyond that, just knew that I had about two and a half weeks to get back to Hong Kong for my flight to Mongolia. The English ability of most people in China is very low, and it was only the occasional hotel worker with whom I'd be able to communicate. My coming to Chenyang – where I took this photo – would probably have never happened if I'd planned in advance, because it is relatively unknown, especially for foreign visitors. So I'm glad I was as unprepared as I was, because seeing this ancient bridge was one of the highlights of my time in China. Available in the following sizes (Rectangle B): 12x8, 18x12, 24x16, 30x20, 36x24, 45x30. My three-week trip to China wasn't planned to the extent that many visitors would be comfortable with. After arriving in Hong Kong, I flew two hours north, to Zhangjiajie National Park, and beyond that, just knew that I had about two and a half weeks to get back to Hong Kong for my flight to Mongolia. The English ability of most people in China is very low, and it was only the occasional hotel worker with whom I'd be able to communicate. My coming to Chenyang – where I took this photo – would probably have never happened if I'd planned in advance, because it is relatively unknown, especially for foreign visitors. So I'm glad I was as unprepared as I was, because seeing this ancient bridge was one of the highlights of my time in China. Available in the following sizes (Rectangle B): 12x8, 18x12, 24x16, 30x20, 36x24. 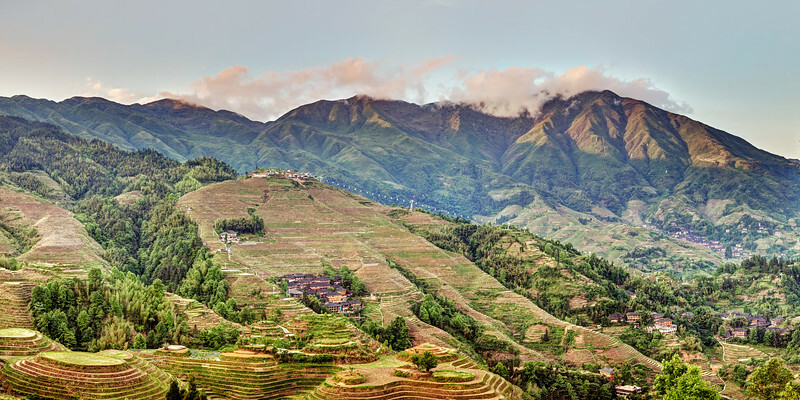 The Longji (sometimes called Longsheng) Rice Terraces, in Guangxi Province, China, are beautiful, and reminiscent of a nearly-lost time. I was fortunate enough to spend three days here in 2015, and saw the terraces under a variety of lighting conditions. It was a lot of fun to walk for miles and miles through the terraces, and the many villages that dot the surrounding countryside. To this day, I look back and miss staying in the lodges here, trying to figure out how to communicate with the proprietors whose English abilities were typically as good as my Chinese - i.e. nonexistent. Although I did spend three days here, I only had one good sunrise (and no good sunsets), but I didn't miss the singular opportunity I was given to get this spectacular photo. Available in the following sizes (Rectangle B): 12x8, 18x12, 24x16, 30x20, 36x24, 45x30, 60x40, 72x48. 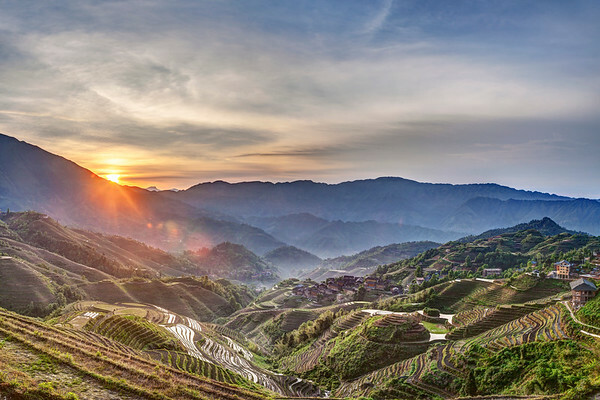 The Longji (sometimes called Longsheng) Rice Terraces, in Guangxi Province, China, are beautiful, and reminiscent of a nearly-lost time. I was fortunate enough to spend three days here in 2015, and saw the terraces under a variety of lighting conditions. It was a lot of fun to walk for miles and miles through the terraces, and the many villages that dot the surrounding countryside. To this day, I look back and miss staying in the lodges here, trying to figure out how to communicate with the proprietors whose English abilities were typically as good as my Chinese - i.e. nonexistent. The landscapes here are so massive here that panoramic photos really do them the best justice. Available in the following sizes (Panorama A): 20x10, 24x12, 32x16, 40x20, 48x24, 48x24 Triptych (3 x 16x24), 60x30, 60x30 Triptych (3 x 20x30), 72x36, 72x36 Triptych (3 x 24x36).